The Series SN Solenoid Valves are designed to easily mount directly to pneumatic valve actuators reducing the need for tubing, fittings or brackets, thereby reducing assembly cost. The SN solenoid comes with nitrile o-rings and offers a manual override as a standard feature. The 3/2 solenoids are designed for spring return actuators and 5/2 solenoids are designed to be used with double acting actuators. The SN series is available in a variety of voltages for any application. 24 VAC, 110 VAC, 220 VAC, 12 VDC, or 24 VDC. 22 to 116 psi (1.5 to 7.9 bar). 23 to 140°F (-5 to 60°C). 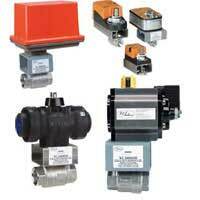 NAMUR mount means the solenoid can be mounted directly to valve actuators. Designed for double acting or spring return actuators.